Which is best – Google Maps or BING? Or sit on the fence and use both? Here’s the scenario – You’ve persuaded your daughter that yes – she can run a half marathon, and yes she can run the Rainbows Hospice Equinox* run in 7 weeks from now. You’ve even gone out for a 10.5 mile local run with her on a Sunday morning. The run we did was a straightforward road run, so I could drive it – can’t drive along the dirt tracks at the Equinox run. The question then is which map do we use on t’internet to give us the best idea – is it Google or is it Bing? The answer seems to be both. As we know the route is going to go across paths, make sure to untick ‘follow roads’. This will make it a bit tricky – and beware of getting too accurate, the profile tool does have a restriction on the number of points allowed. The follow roads may cause problems! 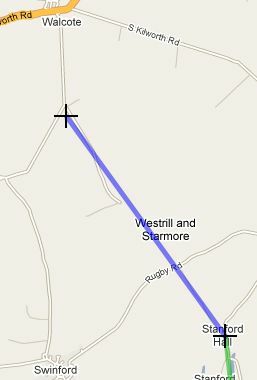 So – on google maps we can find our start point ..
On the map note the ‘discontinuity’ where Google Maps doesn’t have the path past the trig point. 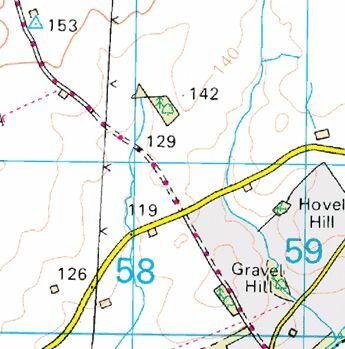 Mark up the map, then click on ‘pop’ up, then use Cropper (if you haven’t seen Cropper – search for it in this blog) to get the bit you want. Today’s run looks like this ..
And most people think Leicestershire is totally flat! Answer – the Equinox is longer, but (possibly!) less uphills. If you look at the scaling, it appears that the Equinox is a combination of a long downhill followed by the local run. 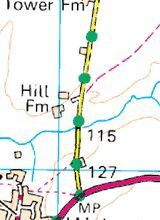 (The long downhill is fortunately because the run starts on a watershed and doesn’t finish on one). This can either be run, walked or cycled (or even a combination of half walk half cycle!). Proceeds from the event are for Rainbows – the East Midlands Children’s Hospice. If you’d like to take part, please respond below. If you’d like to win a meal for two, our local pub that does wonderful home made food is providing a meal for two for the winner of a sweepstake on Sarah’s finish time. Again – to take part reply on the comment form.